Adios contains a mixture of natural herbal ingredients and extracts. 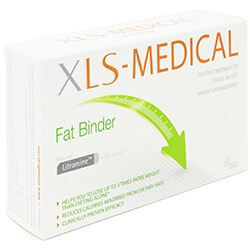 It is a traditional herbal medicine to aid slimming – used alongside a balanced diet and regular exercise. Oral use only. 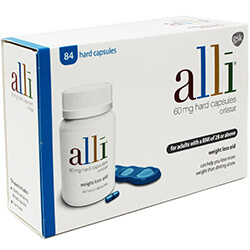 For adults (18 years and above): One Adios tablet three times a day. 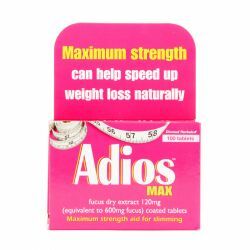 Adios MAX should be taken as part of a calorie-controlled diet combined with extra exercise. 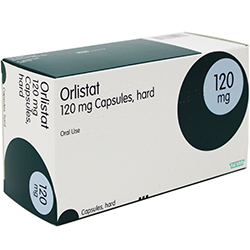 The use in children and adolescents under 18 years and the elderly is not recommended. Each coated Adios tablet contains: 120mg of extract (as dry extract) from Bladderwrack thallus (Fucus vesiculosus L.) (5:1) Extraction solvent 30% methanol. The other ingredients are: Tablet core: lactose monohydrate,sodium starch glycollate, calcium hydrogen phosphate dihydrate (E341), talc, magnesium stearate. Tablet coating: titanium dioxide (E171), talc, kaolin light, sucrose, acacia. As with any medicine, isolated reactions are possible and rare individuals may be sensitive to any of the ingredients. To minimise the possibility of adverse reaction, follow the labelled directions for use and do not take more than the stated dose. Hypersensitive to any of the ingredients. If you are under 18 years or if you are elderly. If you are taking other medicines or dietary supplements containing iodine. If you have been told by a doctor that you have a sugar intolerance as Adios Max contains lactose and sucrose. If you are being treated for a thyroid disorder. If you are taking anticoagulant treatments. If you are unsure whether you should take Adios Max Tablets we recommend that you speak to your doctor or a pharmacist first.